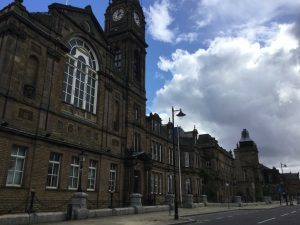 Sefton Council is exploring opportunities to create a cultural and heritage facility within Bootle Town Hall complex of Grade II listed buildings. In October 2016, Sefton Council published the Bootle Town Centre Investment Framework – a high level strategic document which looked to harness Bootle’s current assets and help reshape the town into a desirable residential, educational and business location. Feedback gained from the Investment Framework highlighted Bootle Town Hall as a great regeneration opportunity with the desire for increased cultural activity a key theme. Now a consultation and engagement exercise is set to start, looking at the potential to create a new cultural and heritage facility in the former Bootle Free Library and Museum within the town hall complex. Other civic functions within the town hall would still be maintained. The consultation will run from October-December and a pop-up heritage centre looking potential options will also be in the Strand Shopping Centre during the school October half-term. Cllr Marion Atkinson, Sefton Council’s Labour Cabinet Member for Regeneration and Skills, said: “By transforming this historic building into a new home of arts and culture in the town, we believe this would be a major statement of the Council’s ambition for Bootle. “Potentially this refreshed physical space will be supported by a learning and skills infrastructure, reaching out to the local community and developing materials that can be used in local schools, adult education centres and beyond. “We believe this project will help ensure the town hall remains the civic focus of Bootle and also deliver a new cultural offer that will be sustainable and manageable over the long term.